You have a database (MySQL, PostgreSQL, see supported database types), a tweet pattern and wants to automatically tweet on a regular basis? No need for RSS, fancy tricks, 3rd party website to translate RSS to Twitter or whatever. Just use db2twitter. The new version 0.6 offers the support of tweets with an image. How cool is that? 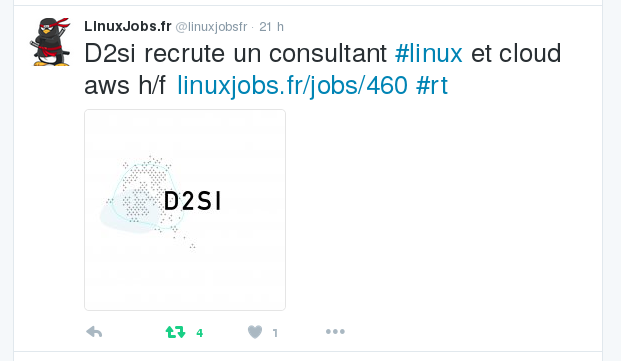 db2twitter is developed by and run for LinuxJobs.fr, the job board of th french-speaking Free Software and Opensource community. db2twitter is coded in Python 3.4, uses SQlAlchemy (see supported database types) and Tweepy. The official documentation is available on readthedocs.